DERRY CITY manager, Kenny Shiels insists he will ‘pull out all the stops’ in a bid to persuade Patrick McEleney to commit his future to the Brandywell club this week. The Magherafelt man, who returned from a trip to Scotland yesterday where he was a guest at his former club Kilmarnock, will hold meetings with City chairman, Philip O’Doherty and McEleney in the next few days in the hope of sealing the player’s signature. League champions Dundalk, who lost their star midfielder, Richie Towell to Championship leaders Brighton this week, are heavily linked with the player and are understood to be considering paying a compensation fee to the Brandywell club. And while Shiels concedes the club are not in a position to enter a bidding war with the ‘Lilywhites’ given the champions’ financial clout, he remains hopeful of securing McEleney’s services for next season. “I spoke with him today (Monday) and I’m trying to get things sorted as soon as possible,” he said. “We’re pulling out all the stops to get him. “I’m meeting with the Chairman to discuss what we can offer and then I’ll feed that back to Patrick. “I don’t think I’ll have to use any pitch in an attempt to encourage him to sign, other than what I can offer him in terms of his player progress. “He knows all about the club and knows what it can do for him in terms of his future. “It’s not an easy one because we can’t compete financially with other clubs. But he knows Derry is a club that will look after him. He’s a local boy and we’ll do everything we can to support him. Meanwhile the club have arranged another pre-season friendly next Tuesday, December 8th at Brandywell Stadium against Limavady United. And Shiels expects to have at least three trialists in his squad for the game including Danish defender, Niclas Vemmelund. 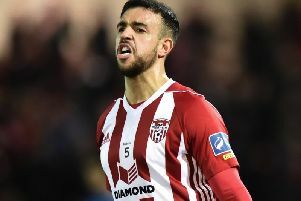 The Derry boss has been tracking the 23 year-old right back for some time and has invited him across for next Tuesday’s match against the ‘Roesiders’. Vemmelund won the Icelandic championship with UMF Stjarnan and played a part in their 2014 UEFA Europa League run as they knocked out SPL side Motherwell and reached the play-offs in 2014 before losing to Inter Milan. Good with both feet, Vemmelund has played for the Danish U19 international side and has played for OB Odense and FC Fyn. The Dane is expected to be one of at least three trialists on show on Tuesday night as Shiels takes the opportunity to have another look at the club’s underage representatives. “People will have to be patient as we bring young players through,” said Shiels. “I don’t want to bring through too many in one batch. But there are certain players who deserve a chance. “We have lots of good, young raw talent coming through. I’m not saying that’s going to give us a massively successful season but it’s a blooding season for those players. “We do have a player coming from Scandinavia, one from Scotland and one from England,” he revealed. “I’m watching players all the time so I’ve been working away,” he concluded.